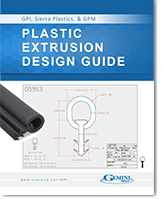 Strategically located across North America, Gemini Group’s three extrusion facilities specialize in manufacturing custom plastic extrusions for OEM, Tier-1 automotive, lawn and garden, medical, consumer and appliance industries. Our extrusion team is horizontally integrated with all Gemini Group business units, which positions us as experts at driving cost out of products and reducing lead times up to four weeks compared to our competitors. Get an inside look into Gemini Group’s extrusion facilities in our latest video tour! Square Footage: 195,300 sq. ft.
Square Footage: 281,000 sq. ft.
Square Footage: 105,000 sq. ft.
Do you need at least 10,000 parts per project or purchase north of $100,000 annually in extrusions? If so, we should connect!